Two weeks ago a strong wind knocked over one of the (empty) rainbarrels and it rolled into Hive #1. 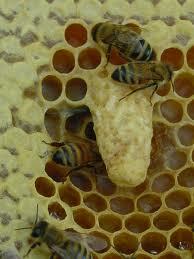 The colony had successfully made it through the winter, and the queen was laying, comb was being built. After the storm, I noticed that a huge cloud of bees were hovering around the hive. Something had to be wrong. I geared up, smoked the bees and went in to see what was the matter. Two of the fresh combs had been knocked loose and were laying on the bottom. No wonder the bees were so upset! I took the combs out, brushed off the bees, closed up the hive and reattached them to the bars. The next day I replaced them and hoped all would be OK. A week later I went in to see how things were going and looked for the queen…. couldn’t find her. About 5 days later, I checked on the hive…. still no queen. I also noticed that there were larva and a lot of capped brood, but no new eggs. Something definately happened to the queen….perhaps she was injured from the accident. I also noticed three big queen cells that they had built. I talked with my bee mentor Steve Wall, and he said to leave the hive alone for three weeks so that the new queen can establish herself with the colony. So… I will wait. I’ll report back then to let you know how the colony is doing. If she mated successfully, I will see evidence of new larvae. If not, I will have to acquire a new queen. This will be interesting!